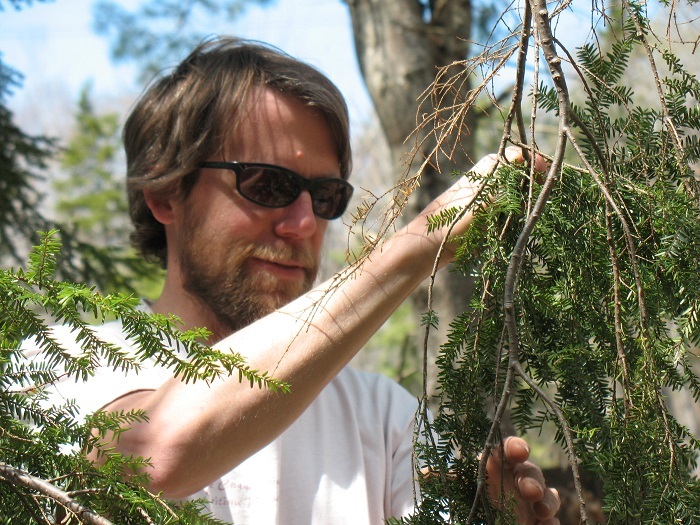 Vermont has been invaded by an insect called the hemlock woolly adelgid (HWA). This tiny insect is recognized by the white, fuzzy covering it hides under. This covering is rarely more than 1/16 of an inch in diameter and looks something like the end of a cotton swab attached to the underside of hemlock twigs. The covering, or ovisac, protects the adelgid and its eggs from predation and drying out. Hidden from view, adelgids feed on starch from the twigs, leading to decline and perhaps tree mortality. Hemlock trees are their only food and are threatened by this invasive insect. Hemlock woolly adelgid is known to be in Windsor, Windham and Bennington County, but threatens hemlock throughout the state. The Vermont Department of Forests, Parks and Recreation is trying to better delineate the infestation. Volunteers are needed to help look for HWA. Training is available. If you do look for HWA while you are out in the woods, whether you found it or not, please let us know where you looked and when by filling in the site tracking form. See links below. In addition to the needed survey work, volunteers can assist in several other important projects. Increasing public awareness is very important, especially in newly infested areas. Volunteers are needed to arrange presentations, set up public displays and educate groups that use the forest. Workshops for homeowners with infested trees can be offered to show people how to respond to HWA. Hemlock trees are an important part of Vermont’s forest ecosystem, providing ecological, economic and aesthetic values. Citizen monitors play a key role in the effort to protect the hemlock resource. If you’re interested in being out in the woods and helping to keep the forest healthy, please contact Jim Esden for more information.